Brazilian rosewood is endemic to the coastal Brazilian Atlantic Forest, one of the most diverse ecosystems in the world. Of the over 8,000 plants species that grow there, Brazilian rosewood is one of the largest, growing to a height of 40m. 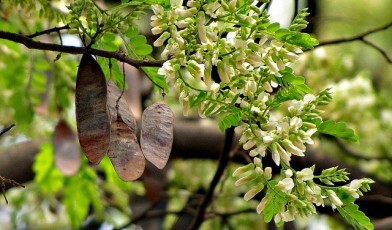 It can also be recognised by its dark branches that grow in zigzag patterns and by its feathery leaflets. The tree is able to withstand a broad range of climatic conditions from tropical lowland forest to sub-montane forest. Nitrogen fixing bacteria and fungi in its roots allows the species to survive in nutrient deficient soils. Throughout a short period between November and December its flowers are pollinated by insects, mainly bees and it produces fruit from January until September. Like all rosewoods, the species has a strong sweet smell reminiscent of the fragrance of roses. The high oil content of the wood also makes it desirable for use as an essential oil for fragrance cosmetics and for use in medicines. Its timber is heavy and strong, making it highly resistant to insect attack and decay. It is therefore much sought after in local markets as a building material for use in flooring, structural beams and wall panelling/lining. Worldwide, its timber, being highly resonant, is also used to make musical instruments. Brazilian rosewood is threatened by illegal logging and habitat loss. Today, the Brazilian Atlantic Forest retains just 7% of its original cover and the Brazilian rosewood now only occurs in fragmented, small populations with low genetic variability in the Brazilian states of Bahia, Minas Gerais, Espırito Santo, Rio de Janeiro and Sao Paulo. Furthermore, the regeneration of this species may be limited, possibly as a result of high seed predation by rodents. In 1992, in response to the threat of logging, Brazilian rosewood became one of the first ever tree species to be listed on Appendix 1 of CITES, prohibiting international trade in the timber or other products from this species. Despite its inclusion the species continues to be illegally logged and traded internationally. For example, in 2009, 249 sheets of Brazilian rosewood timber were seized by TRAFFIC police in Rotterdam. Conservation of small populations of this species is already taking place in protected areas such as the Serra do Mar State Park, an area covering over 315,000 ha that helps to connect smaller fragmented areas of forest. An organisation in Brazil known as Dalbergia Preservation is creating small plantations of the species for reforestation. They also aim to protect remaining trees to assure that the seed stocks needed for future plantations are genetically diverse. Their longer term aim is to create sustainable plantations of this species to meet future demand. To address this aim they offer seeds or seedlings to small communities to grow on their own land, which both enhances the representation of Brazilian rosewood trees in the agricultural landscape and also provides communities with some extra income. The need for protection of the remaining Brazilian Atlantic Forest has been recognised, and 35.9% now has some form of protected status. Despite the high rate of deforestation, the Atlantic Forest is still considered one of the world’s top five biodiversity hotspots. This status justifies sustained efforts to conserve the forest community and iconic species such as the Brazilian rosewood. Varty, N. 1998. Dalbergia nigra. In: IUCN 2010. IUCN Red List of Threatened Species. Version 2010.2. This tree profile was researched and written by Bianca Bergamino and edited by Dr David Burslem, University of Aberdeen, with further edits provided by the GTC team in 2013.